Please Please have Trump show respect and compassion to those suffering now in the wake of hurricane Florence. If Not keep Trump in DC . Play the germ angle if necessary. He will make matters worse, as we have seen. Thanks so much for your post. 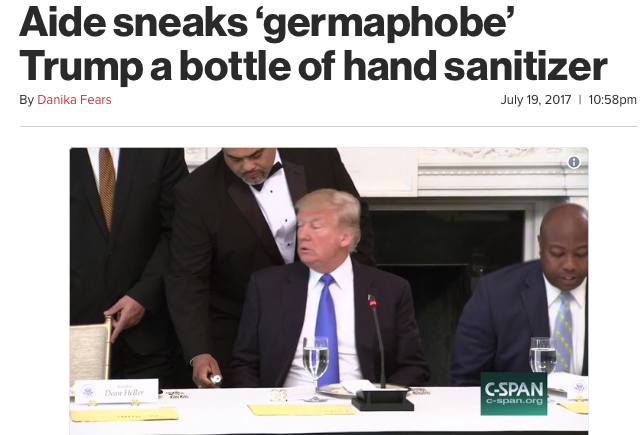 I almost forget about the germ thing with Trump. New Jersey's last governor Christy, made that mistake too. There was a falling out between the two of them. Poor dear, I just don't know how he's going to get through the day. I live in New Jersey, I am fully aware of the limitations, lies, bad business deals of Trump. We unfortunately had to deal with him for years and still do. Almost every weekend he comes to visit his golf course in New Jersey. I just want Trump to think about others, especially now during this crisis. Stop the stunts, lies, send aid and supplies to the American people. No soap boxes, paper towels trowing, just act like the President. THAT would require powers and abilities far beyond those of lil donny trump. I love that picture, he's still wearing the same red tie. To include - how much everyone loves him and the great job he is doing to help them all. Never before has a US president done so much to help so many, blah, blah, blah. He's having another 2020 campaign rally tonight and it's certain he will elicit cheers and support for the sacrifices he will be making in order to visit the horrible, devastated American landscapes. Everyone is anxiously waiting for his appearance. An exercise in a mini second coming. Fist pumping. Throwing paper towels at people. Asking about the condition of the nearest golf course. Cruising the local McDonald's. Back to DC.